Frozen is the biggest animated movie phenomenon of all time. Parents around the world can sing Let It Go with no backing track. If you put Elsa on most any item kids will want it. The Frozen karaoke machine is no different. Kids are guaranteed to love this karaoke machine. But just because the kids will love the picture of their favorite characters doesn't mean the machine is actually well made. Singing is a very educational experience for children. A karaoke machine encourages children to sing. The Frozen Karaoke machine will accomplish that, no matter what. But whether or not it’s one of the best karaoke machines for kids should be scrutinized. There are a few key features that all kiddie karaoke machines should have. First, they should be lightweight, portable, and battery-powered. Kids want to bring their toys with them everywhere. They should be able to carry it with them without trouble. This will also allow them to dance around while they sing. Obviously, durability is a factor with any electronics for kids. Kids karaoke machines should also be able to run two microphones. Kids should be able to share and sing duets. They need to be able to source music from external sources through an auxiliary jack or Bluetooth. However, CD+G discs can be very helpful to the kids. Bluetooth is tough to set up, and being tethered to a device through a cable makes dancing difficult. Some machines for really young children don’t offer a way to display lyrics. But machines for children who are old enough to read should be able to display lyrics on the TV. Other great features can be voice effects. Some help kids learn the lyrics while others are simply fun. Lights and cool design add an extra dose of fun for the kids. 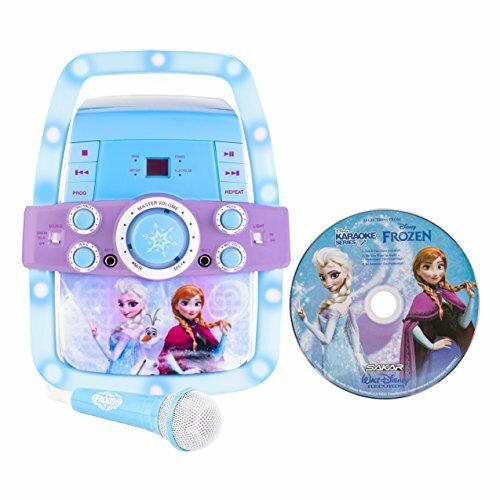 Kids will love the Frozen karaoke machine at first glance. It has a picture of Anna and Elsa on the front. It includes a disc with karaoke versions of Let It Go and Do You Want to Build a Snowman?. It also comes with a Frozen themed microphone. Kids will love the bright LED lights on the front. There is an extra microphone jack, but you will need to buy a second mic. The machine takes CD+G discs, which are music CDs that display lyrics on the screen. You will have to plug the machine into the machine to see the lyrics. But if your kids want to freestyle, the machine has its own speakers. You can also plug in other devices to the audio jack. The machine can run on batteries or with an electric plug. The machine is easy to use, with big knobs and simple buttons. Children will love playing with the Echo and Voice Control functions. All cables are included and are easy to hook up to your other devices. As I’ve mentioned before, the design is the biggest bonus for the machine. Kids adore Frozen and any toys with that theme. But the manufacturers didn’t just rely on the movie to move a cheap product. It is well built and sturdy. It should be able to take a bit of a beating. Being durable doesn’t affect the weight. It is light enough for children to carry around themselves. And it's small enough to travel to parties and take in the car. The speakers are not the quality of your TV, but they are impressive for their size. However, they don’t get too loud, which parents can certainly appreciate. This device covers all the basics. It can connect to the TV. It’s battery powered. It takes CD+G discs and has an auxiliary jack. There are two microphone jacks and one included mic. But it also has a lot of extras. The LED lights and vocal effects make everything more fun. The included power cord saves you money on batteries. The CD+G disc of Frozen songs will be a huge winner with the kids. But you'll be stuck listening to Let It Go an additional 50 times a day. It should cater to a wide range of ages. You could even enjoy it at your parties! I had my doubts about this machine. I assumed that the manufacturers would skate by on the popularity of the movie to sell a cheap machine. However, it is actually one of the better karaoke machines on the market. Getting one for my nephews will make me their favorite aunt, for sure! I bought this machine before my daughter could really read n enjoy it so it’s been stored til now. But the microphone has static when moving cord like it has a short n mic doesn’t work. Im frustrated because I paid quite a bit for this n now they she can enjoy it , the mic is not working. It’s been turned of twice.. Sounds like it is probably a manufacturing defect. If you bought it on Amazon or a retail store you should be able to return it and swap for a replacement. It should not have broken down after only a few uses.